“From now until 2020, the digital universe will double every two years”. More information should mean we can reach conclusions faster. Ironically, having access to mass information also means we make the wrong decisions more frequently. Having explored System 1 and System 2 thinking and the role of cognitive biases in this series, we will now introduce a tool you can use to stop irrationalities from affecting your decisions. 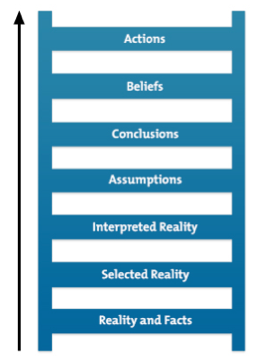 The “Ladder of Inference” developed by organisational psychologist Chris Argyris, is used to help you gain self-awareness of how a ‘fact’ can evolve into a conclusion. Also known as the “Process of Abstraction”, this tool will reduce the amount of erroneous assumptions you make. The Ladder of Inference likens thinking stages to the rungs on a ladder. The ladder starts with data. These are the facts we have available. We select the ‘relevant’ facts we want to acknowledge and add meaning to them from our past experiences. From these ‘meanings’, we begin to draw assumptions about motivation and causality. These assumptions then get filtered and some of them become conclusions. These conclusions form new beliefs or reinforce pre-existing beliefs we have. These beliefs then carry our actions. Argyris explains that this ladder is self-perpetuating. It’s from these cycles that we form conclusions that become the basis of all our assumptions and values. This means: if we start with an incorrect belief, over time this will lead to us completely ignoring facts that are inconsistent with the belief. The Ladder of Inference will help you train your mind to get back to the facts and help you employ expansive thinking. This means, thinking that doesn’t narrow your field of judgment, leading you to miss important information and key insights. Sharing how you reached your conclusion with somebody may help them see your point of view. Inversely, when someone makes a recommendation to you, invite them to share their thinking process with you. 1. Stopping yourself before you jump to a conclusion. You will need to have the awareness to know when you’re reaching a conclusion. Is my data limited? Did I limit the data I chose to work with? What are my assumptions and where did they come from? Am I being rational or emotional? What belief triggered this action? By using this tool, you will find your decisions are more rational and accurate. You’ll also recognise and understand why others might draw conclusions that might not seem the most rational. Next week, we will be exploring critical thinking and some tools you can use to fine-tune your current process. Remember to subscribe to the blog to receive updates. You can catch up here on the last few posts in this series if you haven’t already read them. P.S Missed the last post? Catch up here.